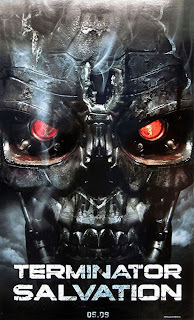 The Billionty-Oneth Geek: Terminator: Salvation... Does it save you? Or should you save your money? 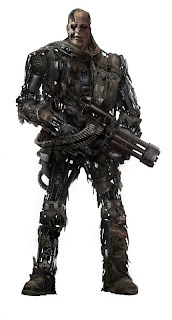 Terminator: Salvation... Does it save you? Or should you save your money? I'd like to start off by saying that I love movies (as if you didn't know) but I've never gone to a midnight screening before. It was a pretty awesome time, but I was kind of tired when we arrived at the theater (we were painting the church walls earlier in the evening). There were more people than I was anticipating, it was near sold out when we got there. Already a line was built up, but thankfully we got pretty good seats, though we arrived an hour before the midnight show. It was quite a wild time, a theater full of rampant geeks. Yet they weren't geeky-geeks in the typical fashion, they were more rough neck geeks; the type of geeks that watch SpikeTV and follow the UFC... my kinda crowd! Anyhow, enough of that. In regards to the movie, I don't quite understand what the critics are clamoring about. Right now on Rottentomatoes, it's sitting at 33% (37 positive reviews out of 117) while Wolverine is at 37% (83 positive out of 225). I can honestly say that I was entertained by Terminator at least tenfolds more than Wolverine. I read all the reviews on AICN before seeing the movie (most of them negative), but the one positive from Massawyrm, said that 90% of the movie was action. I had zero problems with that. The movie takes place post-Judgement Day (from the end of T3) and joins John Connor and his Resistance as they battle the evil SkyNet. The movie equally follows a mysterious convict named Marcus, who was put to death years ago before the apocolyptic Judgement Day occured. As it turns out, they are both trying to get to Kyle Reese (Connor's would be dad) and work together to breach SkyNet. I will agree with the critics in saying that the plot is thin, but I think it more than makes up for it in all the action. And the action here is done well! Once it starts, it doesn't let down. There are a few moments to allow you to catch your breath but during these scenes, you're just anticipating more for the next set piece. One thing that did bug me though involved what should have been a huge twist in the story. For the first half, there's this buildup to something that would be revealed of one of the characters, but unfortunately, this piece of information is revealed clearly in the trailers, removing a lot of the suspense and shock that would have occured otherwise. I think it would have been such an awesome moment had I not known about it from the trailer. I'm not going to say what it is if you don't know, but if you don't remember, I suggest you don't watch the trailer or it'll ruin what should have been a good surprise. For me, what helped make the action so good was with the cinematography and the design of the machines. Much credit has to go to the directors of photography, Michael Fitzgerald and Shane Hurlbut (the latter who was at the short end of Christian Bale's now infamous screaming tirade). In shooting the movie, they used a low palette of colours to make their earth look more barren. Some of the higher profile scenes seemed to employ a lower frame rate to give it more of a rugged look. Combined together, it gives quite a gritty and raw effect onscreen, which you can see from the trailers as well. All the different machines or robots was definitely the highlite of the movie for me. In Salvation, we get to see various models in the T-line (in the past we've seen T-800, T-1000, T-X). What makes it more cooler is that you can see how each progressive model gets better and better, both aesthetically and intellectually. 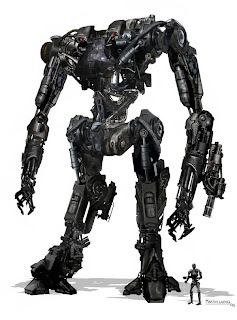 The older T-600 models are nothing but dumb drones and you can see by their look that they've gone rusty and obsolete. My favourite one was this gigantic, building-sized robot that harvested humans. This fucker was humongous and seemingly unstoppable. In addition to all the firepower on hand, he also had these backup motorcycle dudes attached to his legs that he would unleash on to the oncoming survivors. We also get a cameo from one of the prototype T-800s, it was a crowd favourite moment, judging by the cheers. One of the lower end T-600's. This movie would definitely be a fun watch on Blu-Ray with surround sound. I can't wait to see it in high-def. Anyhow, just to end off, I thought it interesting that on it's IMDB profile, fans have voted in and given it an 8.3 out of 10 rating, from 2686 votes. I feel vindicated. But hey, what do we know? Later geeks! Yeah, I didn't love it. It was far too upscale a war for what we've expected to see based on the past movies. In T1 humans are reduced to eating rats; in Salvation they have helicopter squadrons, attack jets, subs, radar, and guided missles. And while I appreciate the look of the machines, I didn't go into it looking for Transformers. As always, digging your site. Hey Slap, glad to hear your point of view! I understand the movie is quite a polarizing one for fans! It was what it was. I guess it helped for me that I tried to watch it without thinking about T1 and T2 which really set things in place. That said, I hope if they decide to make more, that they do keep those flaws in mind. Thanks for dropping by!